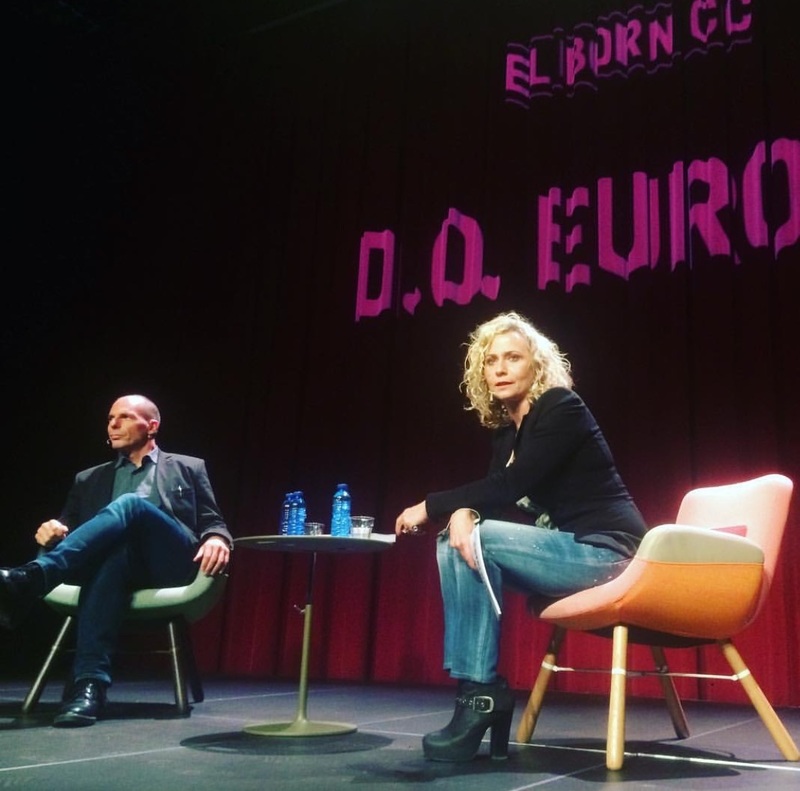 FOREX NEWS kindly took notes of the main points of my conversation with Monica Terribas at the El Born Cultural Centre in Barcelona. I used their notes as a template for notes that I superimposed – see below. To watch the video of the discussion, click here. Just like 1929 brought the gold standard down, setting one proud nation against another, 2008 is doing the same with the euro. In the US, each crisis brought the Americans closer together while in the eurozone the opposite is happening. The eurozone was wrongly constructed – resembling as it did the gold standard. The EU institutions were different. They were not meant as a means of absorbing such conflicts – they were instead intended to manage the affairs of a cartel, initially of coal and steel (that was later expanded to include large farms and, of course, finance). Fixed exchange rates were necessary to stabilise this cartel. The failure of the attempts to create a fixed exchange rate system led to the creation of the euro. In Greece, we suffered the greatest depression since the 1930s. Only 9% of the Greek unemployed has ever received unemployment benefits. In 1967 Greek democracy was overthrown with the tanks. In 2015 they used the banks. We were threatened with the closure of the banks, that threat was realised and yet the brave Greek people still voted NO. Tragically, our government decided to surrender. By surrendering, we did a lot of damage to other left wing European parties. In Brussels, the truth is spoken when microphones are off. In Spain, you rescued the banks and paid with austerity, home requisitions and mass unemployment. When you have different economies and bind them together with a common currency, a tsunami of money begins at the surplus countries heading for the deficit countries. This flow of money comes in the form of loans. In Spain, it came through developers building houses. House prices rose as Spaniards were offered new mortgages, and people felt rich. In Greece, the money went into the state sector. The government built high highways, Olympic stadiums, with corruption ensuring that much of the money was siphoned off to the richer neighbourhoods. This tsunami of loans to Spain, to Greece, to Ireland etc. originated mainly from the surpluses of Germany. It had to be lent because, if it stayed in German banks, German interest rates would have stayd very low. Bankers, naturally, took it and lent it in the countries starved of capital, where interest rates were much higher. Periphery debt, in this sense, is the other side of German, Dutch, Austrian surpluses. When the music stopped, Spanish developers went bankrupt, then the banks and then the state. In Greece, the state went bankrupt first, then the banks follows. But the result was the same as in Spain: self-defeating austerity. We need to break down the unholy alliance between bankers and national politicians – everywhere in Europe. A banker must know that if ‘his’ bank goes bankrupt, he will have to go home. After 2008, we bailed out not the banks but the bankers – in the US and in Europe. Except that in Europe, it was the insolvent states that saved the bankers, pushing their populations into utter misery. Then Europeanize the ‘good debt’ How? From now on, the ECB services the ‘good debt’ on behalf of the member-stateby operating as a go between the state and the money markets. Member-states benefit because the ECB has a good name and it can borrow at near 0% interest rate. So, 40% of total eurozone debt (measured in net present value terms) just goes away without anybody losing money. Now, the ECB is printing money, at the rate of 60 billion per month, to buy debt, causing a major conflict between the ECB and the Bundesbank. The Bundesbank took the ECB to court. With the public debt crisis resolved, we need to Europeanise aggregate Investment: lack of investment os possibly Europe’s greatest long-term problem. Europe has a great deal of debt (private and public). But at the same time Europe also has a great deal of accumulated money. Too much idle money! Rich Europeans have more money than ever. But this mountainous money is idle. Interest rates are below zero, in many places. Rich people with lots of money do not know where to place it – they are too scared to invest it, too fearful to keep it in banks, and when they buy German bonds they often have to pay the German government to borrow from them! German pension funds are a good example of organisations that suffer under these negative yields. The solution would be to invest in productive capacity, including green causes. The problem is that investors fear that, if they invest in the production of commodities, nobody will be able to buy these commodities. So, they do not invest. But then there are no new jobs and people, indeed, cannot afford to buy commodities, thus confirming the negative expectations of investors. Clearly, we need to kickstart investment. For this we cannot rely on private finance. Not can we rely on the member-states to stimulate investment: France is over its spending limits, the southern states are effectively bankrupt, even Germany is reluctant to add to a level of debt that is much above the Maastricht maximum. The European Investment Bank should, and could, ignite investment, with funding of green energy projects as the spearhead. The ECB could then buy these bonds in the secondary market, if there was a need to support their market value. Doing this would not violate the ECB charter at all – and the Bundesbank would be happier with this than with the ECB buying government debt. When rich Europeans see this investment, they will jump in and that will kickstart the whole eurozone economy. It is what the New Deal achieved in the 30s. China saved Europe, Germany in particular, after 2008. The Chinese government cranked up investment to 50% of GDP – unprecedented. German exports grew, making amends for their decline within Europe, thanks to China. The Chinese knew that they were buying time – 5 years to create demand within and without China. But we, Europeans, have failed to mend Europe’s economy and to help the Chinese to help us. Now China is deflating while Europe is nowhere near recovering. The current situation is a gross failure of the eurozone and of European governance. The Eurogroup, as an institution, is not distinguished by its collective intellect. It may contain intelligent individuals but the whole is far less than the sum of the parts. Luis de Guindos is a clever man who knows what the problems are. But in the Eurogroup he is contrained to repeat the mantra. Schäuble is also an intelligent man but he too keeps repeating the ‘rules mantra’ without allowing for a any debate on the rules’ appropriateness. We Europeans should be ashamed of the level of poverty that has risen as a result of the mismanagement of an inevitable crisis. And we should be ashamed of the way Europe treated refugees. Poverty is a political issue, and aids the rise of the extreme right. If Draghi were to write a cheque to poor families, that could be used to buy food, this would have a major unifying effect for Europe. Should the ECB print this money? The ECB is not allowed to do this. But we could agree to use the billions that accumulate every year in the ECB’s Target2 account to fund a US-style food stamp program. The old political system, based on national parties, that then create alliances in Brussels doesn’t work. It should be based on a common program of what we want to do. It should be as inclusive as possible. We want to democratize Brussels. The idea of one person one vote is radical in today’s undemocratic Brussels, where true democracy is treated like a threat. The Eurogroup should be accountable to a parliament. At the current stage of Europe’s degeneration, these simple ideas are radical. There are 4 timeframes (see below) for taking action throughout Europe – but we don’t need a top down party to do this. I am going all around Europe to spread the word. Greece is important to me for the effect it had on our people. But to Europeans Greece is important because it is the laboratory in which terrible policies are tried and tested before being exported to the rest of Europe. People came to talk to us not because of pure solidarity to the Greeks but because of fear that what happened in Greece will happen to them. The mentality of old party politicis is no longer useful or progressive. Our movement should aim to be a European network open to members belonging to different national parties. Even incorruptible conservatives who are sick and tired of the lack of democracy/transparency should be encouraged to join us. Implementation of the four policies mentioned above that do not require treaty changes but can stabilise and reverse the crises of public debt, banking, investment and poverty. A United Europe based on the principles of Decentralised Europeanisation – of a Europe in which democracy operates at the level of cities, regions, states and the Union itself. On the one hand, we should aim at institutions that Europeanise (with minimum discretion for the bureaucrats) public debt management, a proper banking union, aggregate investment management and anti-poverty fighting schemes. On the other hand, this Europeanisation of Europe’s four large problems will allow for authentic, decentralised democracy at the level of communities, cities and regions. If we agree on such a minimal program for democratising Europe, and we shape it in way that reflects public opinion across Europe, our Pan-European front, movement or network will take a life of its own, it will evolve, and we will be amazed by what it will come up with. A: What happens in Catalonia was what happened in Greece – Greek felt ‘alone’ in Europe. Like Catalans do. Onlu we are not alone. The problems of the Greeks, the Catalans, the Germans are too alike. But only a Pan-European movement can annihilate that feelng of loneliness which paralyses us into inaction. Q: How do you encounter the media? A: By articulating a solid, rational program and ignoring their propaganda. Europeans will respond to it and the media will be shamed in following us or risk ending up like the Soviet media that no one believed after a while. A: The Eurogroup is a very unpleasant place. But I was never downhearted in the Eurogroup. No, the sadness and the disappointment was felt at home, in Athens, when some of my comrades began, from April onwards, to prepare for the eventual surrender. That’s whay I found unbearable and frustrating. But I am happy that I stood my ground till the end. Those six months were just a skirmish in a long war for Europe’s integrity, dignity, democracy and soul.